Ava wakes up, hoping that it&apos;s all been a dream, but Ryan tells her that Kiki is gone. She remembers she was supposed to pick up Avery, but Ryan says CarSon will take care of her. Ryan promises that she&apos;ll get through this with his help. Griffin&apos;s hanging out in the PCPD interrogation room and Alexis is giving him legal counsel. Julian shows up at the station throwing his weight around, but Anna&apos;s having none of it. Liz and Franco are discussing Aiden&apos;s issues when Scott shows up to break the news about Kiki. The two are stunned to hear that she was murdered. Scott says he&apos;s going to check on Ava and brings Franco along. Curtis tells Sasha, Valentin, and Nina about Kiki. He adds that Griffin is being held. Nina brings up the drugging incident and Curtis thinks Sasha should go to the police with that information. Valentin is quick to shut that down. He says Curtis doesn&apos;t have the authority and he would want a lawyer to be present. Once they&apos;re alone, Sasha tells Valentin she&apos;s had enough and she&apos;s leaving. 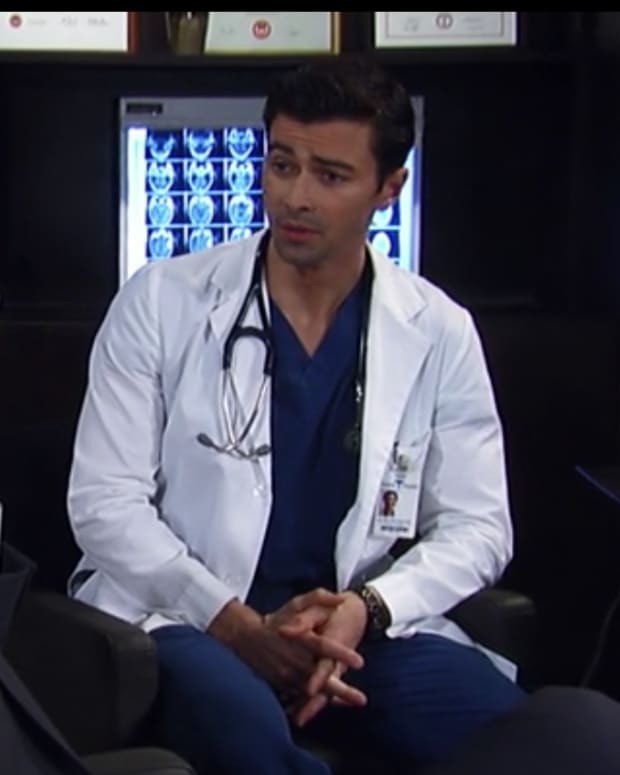 Oscar arrives at the hospital to begin his drug trial. Terry gives him the forms to sign and explains the complications. She says there is no guarantee, but there is always hope. Sam wakes up feeling better from her cold. She and Jason almost share a kiss when Kristina gets home. Jason heads out to pick up Sam&apos;s prescription. Jason runs into Drew at the hospital and offers his good wishes to Oscar. Julian stops by to see Ava, but Ryan doesn&apos;t want him to disturb her. He gives Julian a prescription to fill for her. Griffin swears to Anna he didn&apos;t kill Kiki. She believes him, but says this murder wasn&apos;t random and Kiki was targeted. Anna asks him who would want to hurt Kiki and promises to prove his innocence. Jordan tells Alexis that Julian needs to be contained. She doesn&apos;t want him to interfere with the investigation. Alexis believes Griffin didn&apos;t kill Kiki. She thinks the knife was planted. She wonders who knew enough about Griffin to frame him for murder. Franco sits with Ava, who blames herself for everything. She tells Franco to leave. Scott is thankful that "Kevin" is there for Ava. After they two leave, Ava continues to blame herself for wishing harm to come to Kiki. Ryan tells her she did nothing wrong, but Griffin did. Julian runs into Kim at the hospital. She apologizes for her behavior on Thanksgiving. Julian returns to Ava&apos;s with the prescription. Ava is gone and Ryan finds bullets on the bed. Ava shows up at station to see Griffin.